More than 3,700 attendees came out for the New York Tennis Expo on Feb. 10 at NYCB Live, home of the Nassau Veterans Memorial Coliseum in the largest event of its kind in the country. This marked the fifth New York Tennis Expo, the first held in conjunction with a professional tournament. This year’s installment of the Expo came together after it was announced that the Memphis Open would be relocating to Long Island. Based on the previous success of the Expos and the large amount of people the event attracts, Long Island Tennis Magazine knew it would be the perfect kickoff event for the inaugural New York Open. The event was free to attend, and more than 60 exhibitors and sponsors from the tennis world and beyond filled the Expo Hall to showcase their companies and services to the attendees. There were fun things to do and events all day-long, highlighted by the Expo’s array of activities. The tennis teams from Fordham University, New York Institute of Technology (NYIT), Farmingdale State and Nassau Community College were on the Grandstand Court throughout the day, conducting clinics and playing points with attendees. The Activity Zone was located inside the Expo Hall, and featured a multitude of things to do. New to the Expo was a Beach Tennis Arena, which was packed all day long and run by New York Beach Tennis pros, giving guests a sense of summer fun in the middle of winter. There were two 10 & Under mini courts, sponsored by USTA Eastern, where pros would work with kids as a part of Net Generation Clinics. 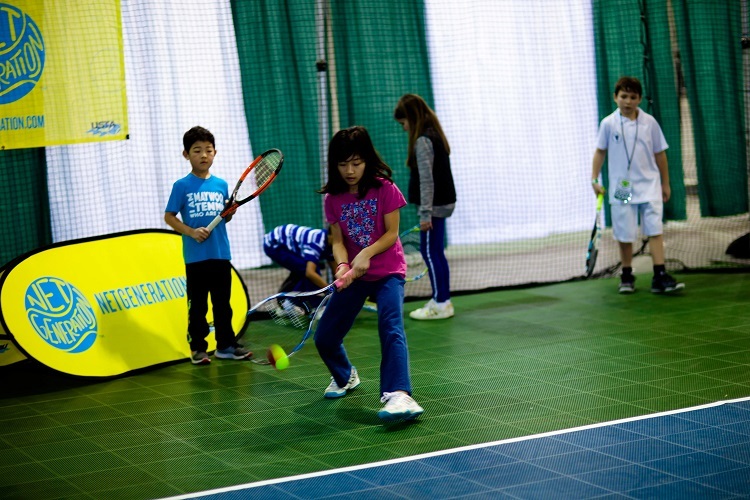 Throughout the Expo, kids had a chance to step onto USTA Eastern's 10 & Under mini courts to play. The Expo had the tennis world covered for all ages and levels, ranging from 10 & Under Tennis, all the way through the professional ranks, as throughout the day, guests were able to watch professional players, including Kei Nishikori and the Bryan Brothers, practicing on the Stadium Court as they trained ahead of the start of the New York Open. The New York Islanders ICE Tour had a bouncy house and a Slap Shot Booth for some non-tennis-related fun for guests to take part in, while Sportime set up a Speed Serve Booth for folks to try to dial up their fastest serve. The Expo covered the fashion aspect of tennis, as well with a Tennis Fashion Show in the afternoon, which showcased some of the latest trends in tennis apparel and accessories featuring a number of the top brands in the industry, including 30fifteen, inPhorm, Vibe Tennis, Lucky in Love, Faye & Florie, Denise Cronwall, Up or Down Spin and Corey Paige Designs. The apparel was modeled by the boys and girls from the Roslyn and Syosset tennis teams. The Syosset and Roslyn tennis teams modeled tennis fashion and apparel during the Expo's Tennis Fashion Show. Some of the sport’s top local coaches and minds took part in two Speaker Seminars during the Expo. The first was “The Road to College Tennis,” headlined by former collegiate stars and current ATP Tour players Chris Eubanks and Cameron Norrie. The second panel focused on “Taking Your Game to the Next Level,” and featured ATP player Dudi Sela of Israel joining a renowned panel of coaches and experts. The center of the Expo hall was home to the New York Tennis Expo Broadcast Plaza, where video and radio interviews with exhibitors and attendees were conducted throughout the day. As the lead-in event for the New York Open, the tournament’s Draw Ceremony was held at the Broadcast Plaza and featured appearances by Ryan Harrison, Jared Donaldson and Sebastian Korda. Ryan Harrison speaks to attendees at the New York Tennis Expo before the New York Open's Draw Ceremony took place. Canadian star Eugenie Bouchard, who participated in the New York Open’s Opening Night Premiere, stopped by for a meet-and-greet with guests and signed autographs. 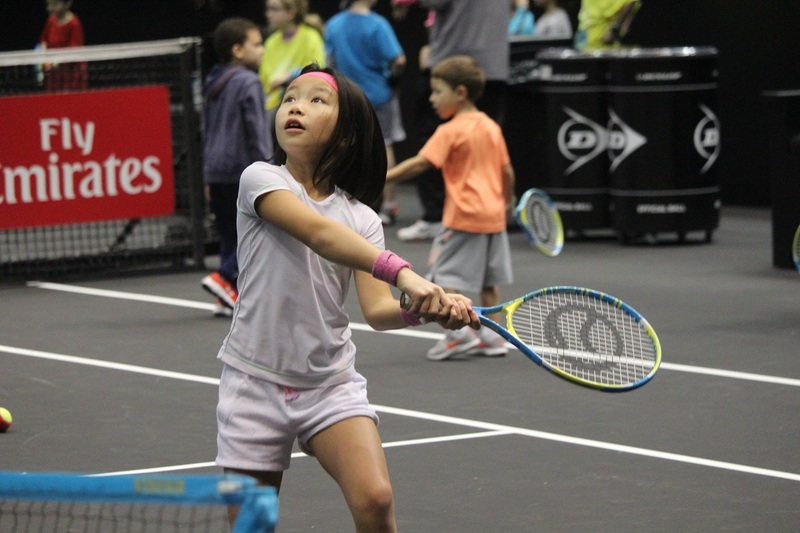 The New York Tennis Expo was a celebration of tennis that brought together the community for a free day of family fun and ushered in the debut of the New York Open. It could not have been possible without local support, and the support from many companies and people nationally and internationally, in addition to the nearly 4,000 attendees who came out to make the event such a success. CLICK HERE to see more photos from the 2018 New York Tennis Expo. CLICK HERE to see the Expo Recap Video.